The first acute respiratory distress consensus definitions date from 1998. The North American European Consensus Conference was held in 1994 and defined ARDS as acute respiratory failure with: Acute onset, bilateral chest infiltrates on radiograph, a PaO2/FiO2 below 200 (ALI < 300 vs. ARDS < 200) and absence of congestive heart failure as evidenced by a wedge pressure below 18 mmHg . 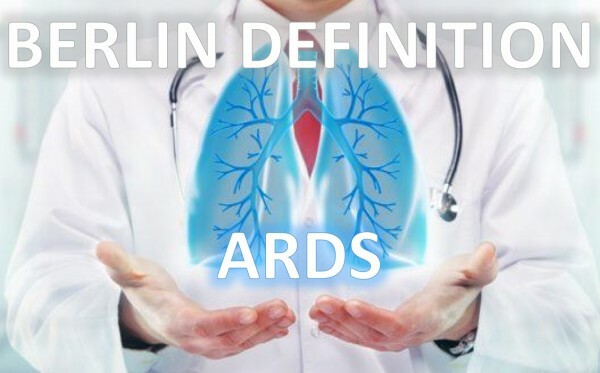 Recently in Berlin a new ARDS definitions was suggested  and a consensus of 16 was published with an update on respiratory monitoring . The new Berlin Definition, focused on feasibility, reliability, validity, and objective evaluation of its performance. The new definition proposed 3 mutually exclusive categories of ARDS based on degree of hypoxemia: mild (200 mm Hg < PaO2/FiO2 <= 300 mm Hg), moderate (100 mm Hg < PaO2/FiO2 <= 200 mm Hg), and severe (PaO2/FiO2 <= 100 mm Hg) and 4 ancillary variables for severe ARDS: radiographic severity, respiratory system compliance (<=40 mL/cm H2O), positive end-expiratory pressure (>=10 cm H2O), and corrected expired volume per minute (>=10 L/min). This blog summarizes our previous comments and a call for a new and simple definition for ARDS . The Berlin definitions are summarized in Table 1. A recent study by LeTourneau et al. adds another brick to the growing wall of studies supporting the clinical usefulness of extravascular lung water (EVLW) measurements by transpulmonary thermodilution (TPTD) . Previous studies have demonstrated that TPTD provides a clinically acceptable estimation of EVLW as compared to thermo-dye dilution , quantitative CT scan  and gravimetry [8, 9], is able to detect small changes in EVLW content , and is useful to assess the efficacy of therapy [11, 12]. Previous studies also showed that EVLW is also a prognostic marker in patients with acute lung injury (ALI) and acute respiratory distress syndrome (ARDS), actually a better prognostic marker of mortality than dead-space fraction . In the present issue the same group suggests that EVLW is an early marker of ALI, EVLW increasing in average 2.6 days before the appearance of ALI criteria, as currently defined by the American and European Consensus Conference. The consequences of an early detection of ALI remain to be established but one can easily imagine that it would affect the way patients are treated, for instance the amount of fluid they receive, and ultimately the duration of mechanical ventilation and ICU length of stay. Further studies are of course needed to confirm this hypothesis. Interestingly, in light of their findings, LeTourneau et al. also suggest to revisit the current definition of ALI/ARDS. The current definition of ALI/ARDS is based on the association of bilateral pulmonary infiltrates on chest radiography, a PaO2/FiO2 ratio below 300/200 mmHg, and the lack of evidence for left ventricular dysfunction. This definition may indeed deserve to be revisited for the following reasons. First, chest radiography has several limitations in patients mechanically ventilated in supine position: movements of the chest wall, radiograph film placed posterior to the thorax, sub-optimal orientation of the radiograph beam, pleural effusion superimposed on lung opacities . As a result, chest radiography lacks of sensitivity and specificity to detect pulmonary edema  and may be mistaken with pleural effusions, that are not necessarily related to increased EVLW . Second, it is now well established  that the PaO2/FiO2 ratio depends on FiO2, the relationship between the numerator and the denominator being non linear. As a result, decreasing FiO2 decreases the PaO2/FiO2 ratio, which may wrongly suggest a worsening of lung inflammation. Moreover this ratio also depends on the level of positive end-expiratory pressure (PEEP) used. The current definition also does not take into account the differences that may exist between primary and secondary ALI/ARDS and the role of intra-abdominal pressure (IAP) [18-20]. Finally, as pointed out by LeTourneau et al. , the evidence for cardiac dysfunction does not imply causality: patients with chronic cardiac diseases have an abnormal cardiac function on echocardiography also when they develop lung injury. Therefore, the existence of a disease known to increase pulmonary vascular permeability seems more important than the lack of left ventricular dysfunction in order to accurately diagnose ALI/ARDS. Although not a bedside technique, the CT scan is often performed in patients with acute respiratory failure and is dramatically useful to characterize the lung disease process (bilateral or not, patchy or posterior condensations), to quantify pleural effusion, as well as to assess lung recruitment induced by PEEP or other maneuvers. Therefore, the information provided by the CT scan – when performed - could be integrated to the definition of ALI/ARDS. As suggested by LeTourneau et al. , it may also be wise to use EVLW as a definition criteria. Although TPTD is useful to assess hemodynamic parameters  and detect right-to-left intracardiac shunts , it is not yet standard of care. The use of TPTD requires a central venous catheter for cold bolus injections (the thermal indicator) and a central (usually femoral) thermistor-tipped arterial catheter to record thermodilution curves. The use of femoral arterial catheters remains today an exception in the US. The reasons for that are unclear since complications are rare  and may not be more frequent than with radial catheters. Moreover, the femoral arterial pressure is well known to give a better estimate of central pressure, particularly in septic patients . If most patients with severe ARDS are frequently instrumented with an arterial line and a central venous line, it is usually not the case at a early stage of lung inflammation. Therefore one may hardly impose EVLW as a mandatory criteria for defining ALI/ARDS. TPTD measurements also allow to calculate the pulmonary vascular permeability index (PVPI) which allows stratification into hydrostatic versus permeability lung edema . A recent study showed that PVPI had the best predictive power for diagnosing ARDS . However, when TPTD is used, we fully agree with LeTourneau et al. that it would make sense to take into account EVLW measurements. As pointed out by others it may be equally important to differentiate primary (pulmonary) versus secondary (extrapulmonary) ALI/ARDS, the latter usually associated with increased IAP, as this may dramatically impact the respiratory mechanics and the way we should recruit and set PEEP [20, 27, 28]. Finally, as already suggested by others  it might also be wise to integrate FiO2 in the definition. For instance one may propose to replace the PaO2/FiO2 ratio < 300 by the need to use a FiO2 > 40% to maintain a SaO2 > 95% and the PaO2/FiO2 ratio < 200 by the need to use a FiO2 > 60%. Although this suggestion has also limitations since a patient may be on 70% FiO2 but he/she may not need it (eg underlying COPD) – we still have to look at P/F ratios at that time – so the combination between FiO2 and P/F ratio makes sense in specific cases. A recent study suggests that adding PEEP to the definition would not help . In summary, when taking into consideration all the elements discussed above, one may propose a new definition for ALI/ARDS described in Table 2 . With this definition, a patient with swine flu, an EVLWI > 10 ml/kg PBW and ventilated with a FiO2 of 50% would have ALI, a patient with bacterial pneumonia, bilateral consolidations on CT scan and ventilated with a FiO2 of 70% would have an ARDS, and so on. We believe this definition has the advantage to be simple and to take into account the clinical and physiological information most clinicians have access to when treating patients with acute respiratory failure in 2017. Bernard GR, Artigas A, Brigham KL, Carlet J, Falke K, Hudson L, Lamy M, Legall JR, Morris A, Spragg R: The American-European Consensus Conference on ARDS. Definitions, mechanisms, relevant outcomes, and clinical trial coordination. Am J Respir Crit Care Med 1994, 149(3 Pt 1):818-824. Ranieri VM, Rubenfeld GD, Thompson BT, Ferguson ND, Caldwell E, Fan E, Camporota L, Slutsky AS: Acute respiratory distress syndrome: the Berlin Definition. JAMA : the journal of the American Medical Association 2012, 307(23):2526-2533. Brochard L, Martin GS, Blanch L, Pelosi P, Belda FJ, Jubran A, Gattinoni L, Mancebo J, Ranieri VM, Richard JC et al: Clinical review: Respiratory monitoring in the ICU - a consensus of 16. Critical care (London, England) 2012, 16(2):219. Michard F, Fernandez-Mondejar E, Kirov MY, Malbrain M, Tagami T: A new and simple definition for acute lung injury*. Crit Care Med 2012, 40(3):1004-1006. Letourneau JL, Pinney J, Phillips CR: Extravascular lung water predicts progression to acute lung injury in patients with increased risk. Crit Care Med 2012, 40(3):847–854. Michard F, Schachtrupp A, Toens C: Factors influencing the estimation of extravascular lung water by transpulmonary thermodilution in critically ill patients. Crit Care Med 2005, 33(6):1243-1247. Patroniti N, Bellani G, Maggioni E, Manfio A, Marcora B, Pesenti A: Measurement of pulmonary edema in patients with acute respiratory distress syndrome. Crit Care Med 2005, 33(11):2547-2554. Katzenelson R, Perel A, Berkenstadt H, Preisman S, Kogan S, Sternik L, Segal E: Accuracy of transpulmonary thermodilution versus gravimetric measurement of extravascular lung water. Crit Care Med 2004, 32(7):1550-1554. Tagami T, Kushimoto S, Yamamoto Y, Atsumi T, Tosa R, Matsuda K, Oyama R, Kawaguchi T, Masuno T, Hirama H et al: Validation of extravascular lung water measurement by single transpulmonary thermodilution: human autopsy study. Crit Care 2010, 14(5):R162. Fernandez-Mondejar E, Rivera-Fernandez R, Garcia-Delgado M, Touma A, Machado J, Chavero J: Small increases in extravascular lung water are accurately detected by transpulmonary thermodilution. J Trauma 2005, 59(6):1420-1423; discussion 1424. Perkins GD, McAuley DF, Thickett DR, Gao F: The beta-Agonist Lung Injury Trial (BALTI): A Randomized Placebo-controlled Clinical Trial. Am J Respir Crit Care Med 2006, 173(3):281-287. Phillips CR, Chesnutt MS, Smith SM: Extravascular lung water in sepsis-associated acute respiratory distress syndrome: indexing with predicted body weight improves correlation with severity of illness and survival. Crit Care Med 2008, 36(1):69-73. Lichtenstein D, Goldstein I, Mourgeon E, Cluzel P, Grenier P, Rouby JJ: Comparative diagnostic performances of auscultation, chest radiography, and lung ultrasonography in acute respiratory distress syndrome. Anesthesiology 2004, 100(1):9-15. Michard F, Zarka V, Alaya S: Better characterization of acute lung injury/ARDS using lung water. Chest 2004, 125(3):1166; author reply 1167. Deeren DH, Dits H, Daelemans R, Malbrain ML: Effect of pleural fluid on the measurement of extravascular lung water by single transpulmonary thermodilution Clinical Intensive Care 2004, 15(4):119-122. Allardet-Servent J, Forel JM, Roch A, Guervilly C, Chiche L, Castanier M, Embriaco N, Gainnier M, Papazian L: FiO2 and acute respiratory distress syndrome definition during lung protective ventilation. Crit Care Med 2009, 37(1):202-207, e204-206. Cordemans C, De laet I, Van Regenmortel N, Schoonheydt K, Dits H, Huber W, Malbrain MLNG: Fluid management in critically ill patients: The role of extravascular lung water, abdominal hypertension, capillary leak and fluid balance. Annals Intensive Care 2011, accepted for publication. Pelosi P, Quintel M, Malbrain ML: Effect of intra-abdominal pressure on respiratory mechanics. Acta Clin Belg Suppl 2007, 62(1):78-88. Palmers PJ, Vidts W, Ameloot K, Cordemans C, Van Regenmortel N, De Laet I, Schoonheydt K, Dits H, Eichhorn V, Reuter D et al: Assessment of three minimally invasive continuous cardiac output measurement methods in critically ill patients and a review of the literature. Anaesthesiol Intensive Ther 2012, 44(4):213-224. Belda FJ, Aguilar G, Teboul JL, Pestana D, Redondo FJ, Malbrain M, Luis JC, Ramasco F, Umgelter A, Wendon J et al: Complications related to less-invasive haemodynamic monitoring. Br J Anaesth 2011, 106:482-486. Dorman T, Breslow MJ, Lipsett PA, Rosenberg JM, Balser JR, Almog Y, Rosenfeld BA: Radial artery pressure monitoring underestimates central arterial pressure during vasopressor therapy in critically ill surgical patients. Crit Care Med 1998, 26(10):1646-1649. Kushimoto S, Taira Y, Kitazawa Y, Okuchi K, Sakamoto T, Ishikura H, Endo T, Yamanouchi S, Tagami T, Yamaguchi J et al: The clinical usefulness of extravascular lung water and pulmonary vascular permeability index to diagnose and characterize pulmonary edema: a prospective multicenter study on the quantitative differential diagnostic definition for acute lung injury/acute respiratory distress syndrome. Crit Care 2012, 16(6):R232. Gattinoni L, Pelosi P, Suter PM, Pedoto A, Vercesi P, Lissoni A: Acute respiratory distress syndrome caused by pulmonary and extrapulmonary disease. Different syndromes? Am J Respir Crit Care Med 1998, 158(1):3-11.